When Cecily prayed that God would teach her to really love people, she was hoping that the answer would be easy. She didn’t expect to have her life turned upside down, her dreams shattered and her priorities rearranged. Just weeks after her prayer, Cecily’s three year old son was diagnosed with autistic spectrum disorder (ASD), and Cecily and her husband started out on a journey which would be physically hard, emotionally draining, intellectually challenging and spiritually exhausting. And yet the road would lead to love – real, honest, true, gritty love. If you’ve ever prayed a big prayer, or questioned a big God, or faced a big hurdle or felt like you were drowning in a big sea of sadness, this book will lift, help and offer hope – spiritual and emotional hope for the depressed, the suffering and the questioning. For parents and friends of children suffering from the new autism epidemic, this book offers not only emotional support but also practical information and resources to help you find your way through the jungle of diagnosis and therapy. This is Cecily’s story, but it is also God’s story – because He is the one who has been working in her, teaching her to love. 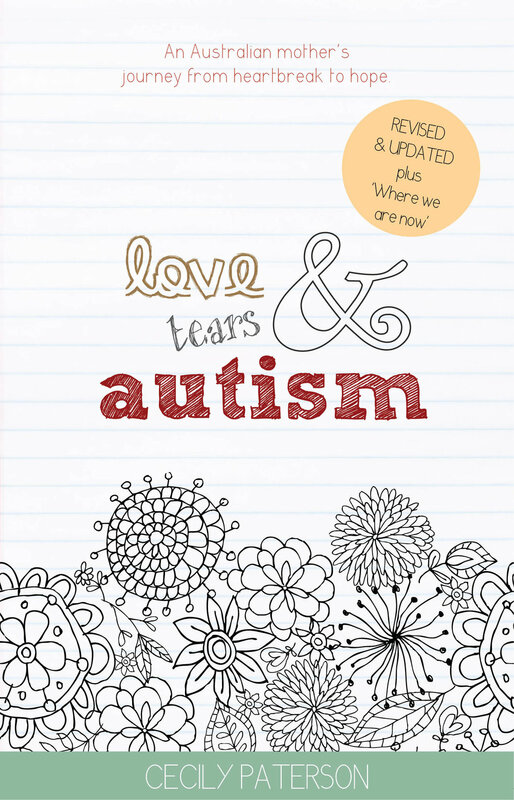 It's so exciting to release this updated and revised second edition of Love Tears & Autism into the world. All the links are updated, and more information added. Plus there's a 'Where we Are Now' chpater, with information on what's happened since the book was first published. Q: Why did you decide to write Love, Tears & Autism? Cecily: I started keeping a blog about my son’s road with autism just after he was diagnosed with ASD at the age of 3. In the five years it has been going, people have found it helpful. I began to think that writing a book from it would be practical and encouraging for families with children on the autistic spectrum. Cecily: Every Thursday for a year, I would drive across Sydney so that I could drop my preschooler and his baby brother at my mother in law’s place for the morning. I’d say a quick goodbye and head out to the shops where I could do all the things I needed to do and then at the end, sit at relax in a café with a book, a piece of cake and a pot of earl gray tea. Read more of Cecily's interview here. Join the Love Tears & Autism community on facebook where you'll find regular updates about the book, autism-related information and other good supportive stuff. There's also a support group you can ask to join. Search for Love Tears & Autism Parent Support Group. “Love Tears and Autism is a book that will change many lives. Cecily Paterson writes with an honesty and directness that will appeal to many readers. In the mood of a modern day blog Cecily writes with breathtaking honesty without ever being indulgent or ever losing hope. In the style of Philip Yancy, she asks the questions many believers think are too impolite to ask. Rev Richard Quadrio, Senior Pastor Macquarie Chapel, President NSW Council of Churches. I was introduced to your book by a friend on facebook. My son was diagnosed with autism 3.5 years ago and it was very kind of her to try and connect with me via your book. Thank you for writing the book - I related well to your frustrations with the diagnosis and subsequent search for answers. I think most parents in Sydney would say that too. But it is good that someone like yourself can express it so well. Friendships are easily sorted with autism, but even the most dependable find it hard to understand and to be honest I really do not have the energy, and in this case the ability to explain the issues involved. I will be using your book for these friends. I really like your section regarding what children with autism need. As autism is reported to affect one in 160 children this is a book for everyone to read. Love Tears and Autism gives us an honest account of Cecily and her family’s agonizing path to their precious son Cameron’s diagnosis of autism. We journey with them through the frantic gut wrenching years that follow. As diagnosis comes Cecily has a clear understanding that God is teaching her to love although this is not a path she would have chosen. Through the dark times, I held on to the fact that I knew what the purpose of all of this was for me. God was teaching me to love, even when I felt no love and even when I wondered if I had the energy to face the next half hour. “As we read this book we see too that what Cecily and Cameron need most is love and acceptance. Cameron’s disability was not always her biggest difficulty – sometimes it was other people’s attitudes and lack of understanding. Cecily bears testimony to the fact that learning love and letting go of being the one in control is not easy. However, depending on God the author of love who is in control, is the only path that offers true hope.